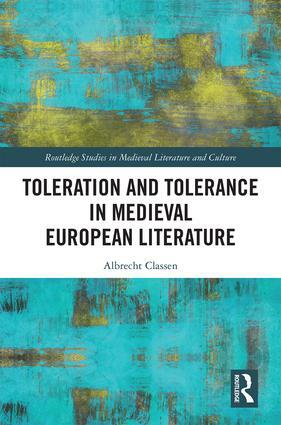 Toleration and Tolerance in Medieval European Literature aims to examine and unearth the critical investigations of toleration and tolerance presented in literary texts of the Middle Ages. In contrast to previous approaches, this volume identifies new methods of interpreting conventional classifications of toleration and tolerance through the emergence of multi-level voices in literary, religious, and philosophical discourses of authorities in medieval literature. Accordingly, this volume identifies two separate definitions of toleration and tolerance, the former as a representative of a majority group accepts a member of the minority group but still holds firmly to the believe that s/he is right and the other entirely wrong, and tolerance meaning that all faiths, convictions, and ideologies are treated equally, and the majority speaker is ready to accept that potentially his/her position is wrong. Applying these distinct differences in the critical investigation of interaction and representation in context, this book offers new insight into the tolerant attitudes portrayed in medieval literature of which regularly appealed, influenced and shaped popular opinions of the period. Albrecht Classen is University Distinguished Professor of German Studies at the University of Arizona where he teaches and research medieval and early modern German and European literature and culture. In his by now ninety scholarly books he has examined many different aspects, most recently water (2017), the forest (2016), death (2016), multilingualism (2016), love, marriage, and sexuality (in several books over the last two decades), friendship, urban and rural space, crime and punishment, women’s voices, etc. He received his Ph.D. from the University of Virginia in 1986. He has received major grants and awards for teaching, research, and service.